In the late spring or early summer of 1699 Captain Kidd's sloop sailed into the mouth of the Delaware Bay and changed the whole fortune of his life. The famous Captain Kidd had a treasure box, which contained log books with information about him. Captain Kidd's treasure box was uncovered by Tom Chist and Parson Jones. It was the belief that those log books did more to get Captain Kidd arrested in Boston town and hanged in London than anything else that was brought up against him. The excerpt below is the story of what it was like to uncover the buried treasure box! Fer as you read you just may want to have a little something to munch on as you discover the buried treasure story below. Parson Jones himself leaped down into the hole, and began scraping away the sand with his hands as though he had gone crazy. At last, with some difficulty, they tugged and hauled the chest up out of the sand to the surface, where it lay covered all over with the grit that clung to it. It was securely locked and fastened with a padlock, and it took a good many blows with the blade of the spade to burst the bolt. Parson Jones himself lifted the lid. Tom Chist leaned forward and gazed down into the open box. He would not have been surprised to have seen it filled full of yellow gold and bright jewels. It was filled half full of books and papers, and half full of canvas bags tied safely and securely around and around with cords of string. Parson Jones lifted out one of the bags, and it jingled as he did so. It was full of money. He cut the string, and with trembling, shaking hands handed the bag to Tom, who, in an ecstasy of wonder and dizzy with delight, poured out with swimming sight upon the coat spread on the ground a cataract of shining silver money that rang and twinkled and jingled as it fell in a shining heap upon the coarse cloth. Parson Jones held up both hands into the air, and Tom stared at what he saw, wondering whether it was all so, and whether he was really awake. It seemed to him as though he was in a dream. There were two-and-twenty bags in all in the chest: ten of them full of silver money, eight of them full of gold money, three of them full of gold-dust, and one small bag with jewels wrapped up in wad cotton and paper. "'Tis enough," cried out Parson Jones, "to make us both rich men as long as we live." The burning summer sun, though sloping in the sky, beat down upon them as hot as fire; but neither of them noticed it. Neither did they notice hunger nor thirst nor fatigue, but sat there as though in a trance, with the bags of money scattered on the sand around them, a great pile of money heaped upon the coat, and the open chest beside them. It was an hour of sundown before Parson Jones had begun fairly to examine the books and papers in the chest. Of the three books, two were evidently log-books of the pirates who had been lying off the mouth of the Delaware Bay all this time. The other book was written in Spanish, and was evidently the log-book of some captured prize. It was then, sitting there upon the sand, the good old gentleman reading in his high, cracking voice, that they first learned from the bloody records in those two books who it was who had been lying inside the Cape all this time, and that it was the famous Captain Kidd. Every now and then the reverend gentleman would stop to exclaim, "Oh, the bloody wretch!" or, "Oh, the desperate, cruel villains!" and then would go on reading again a scrap here and a scrap there. And all the while Tom Chist sat and listened, every now and then reaching out furtively and touching the heap of money still lying upon the coat. One might be inclined to wonder why Captain Kidd had kept those bloody records. He had probably laid them away because they so incriminated many of the great people of the colony of New York that, with the books in evidence, it would have been impossible to bring the pirate to justice without dragging a dozen or more fine gentlemen into the dock along with him. If he could have kept them in his own possession they would doubtless have been a great weapon of defense to protect him from the gallows. Indeed, when Captain Kidd was finally brought to conviction and hung, he was not accused of his piracies, but of striking a mutinous seaman upon the head with a bucket and accidentally killing him. The authorities did not dare try him for piracy. He was really hung because he was a pirate, and we know that it was the log books that Tom Chist brought to New York that did the business for him; he was accused and convicted of manslaughter for killing of his own ship carpenter with a bucket. Well me friends we hope you enjoyed the story about Captain Kidds' Treasure Box. Did your imagination run wild? Pirate tales of long ago are such good adventures. If you need your fill of more pirate stories, be sure to read a review about Captain Hook over at Great Reads! There me friends you can once again be lost in your pirate fantasies. Arrr! We have all heard of an "old wives tale", but perhaps this humorous story is an "old whales tale!" In the sea, once upon a time, O my best beloved, there was a whale, and he ate fishes. He ate the starfish and the garfish, and the crab and the dab, and the plaice and the dace, and the skate and his mate, and the mackerel and the pickerel, and the really truly twirly-whirly eel. All the fishes he could find in all the sea he ate with his mouth so! Till at last there was only one small fish left in all the sea, and he was a small stute fish, and he swam a little behind the whales right ear, so as to be out of harm's way. Then the whale stood up on his tail and said, 'I'm hungry.' and the small 'stute fish said in a small 'stute voice, 'Noble and generous cetacean, have you ever tasted man?' 'No,' said the whale. 'What is it like?' 'Nice,' said the small 'stute fish. 'Nice but nubbly.' 'Then fetch me some,' said the whale, and he made the sea froth up with his tail. Then the whale opened his mouth back and back and back till it nearly touched his tail, and he swallowed the shipwrecked mariner, and the raft he was sitting on, and his blue canvas breeches, and the suspenders (which you must not forget), and the jack-knife. He swallowed them all down into his warm, dark,inside cup-boards, and then he smacked his lips so, and turned round three times on his tail. 'Nay, nay!' said the mariner. 'Not so, but far otherwise. Take me to my natal shore and the white cliffs of Albion, and I'll think about it.' And he began to dance more than ever. For the mariner he was also an hibernian. And he stepped out on the shingle, and went home to his mother, who had given him leave to trail his toes in the water; and he married and lived happily ever afterward. So did the whale. But from that day on, the grating in his throat, which he could neither cough up nor swallow down, prevented him eating anything except very, very small fish; and that is the reason why whales nowadays never eat men or boys or little girls. The small 'stute fish went and hid himself in the mud under the door sills of the Equator. He was afraid that the whale might be angry with him. The white sharks are the dread of sailors in all hot climates, for they constantly attend vessels in expectation of anything which may be thrown overboard. A shark will thus sometimes traverse the ocean in company with a ship for several hundred leagues. Woe to the poor mariner who may chance to fall overboard while this sea-monster is present. Some species of sharks grow to an enormous size, often weighing from one to four thousand pounds each. The skin of the shark is rough, and is used for polishing wood and ivory; that of one species is manufactured into an article called shagreen: spectacle-cases are made of it. The white shark is the sailors worst enemy: he has five rows of wedge-shaped teeth, which are notched like a saw: when the animal is at rest they are flat in his mouth, but when about to seize his prey they are erected by a set of muscles which join them to the jaw. His mouth is so situated under the head that he is obliged to turn himself on one side before he can grasp any thing with those enormous jaws. I will now give you an account of the death of a very brave little boy, who was killed by a shark. He was an Irish boy; his name was Volney Beckner, the son of a poor fisherman. His father, having always intended Volney for a seafaring life, took great pains to teach him such things as it is useful for a sailor to know, and tried to make him brave and hardy; he taught him to swim when a mere baby. Volney was only nine years old when he first went to sea in a merchant ship; the same vessel in which his father sometimes sailed. Here he worked hard and fared hard, but this gave him no uneasiness; his frame was robust, he never took cold, he knew not what fear was. In the most boisterous weather, when the rain fell in torrents, and the wind howled around the ship, the little Irish boy would fearlessly and cheerfully climb the stays and sail yards, mount the topmast, or perform any other duty required of him. At twelve years old the captain promoted the clever, good tempered, and trustworthy boy; spoke well of him before the whole crew, and doubled his pay. Volney was very sensible to his praises. His messmates loved him for his generous nature, and because he had often shown himself ready to brave danger in order to assist them; but an occasion soon arrived in which he had an opportunity of performing one of the most truly heroic deeds on record.The vessel in which Volney and his father sailed was bound to Port au Prince, in St. Domingo. A little girl, the daughter of one of the passengers, having slipped away from her nurse, ran on deck to amuse herself. While gazing on the expanse of water, the heaving of the vessel made her dizzy, and she fell overboard. Volney's father saw the accident, darted after her, and quickly caught her by the dress; but while with one hand he swam to reach the ship, and with the other held the child, he saw a shark advancing towards them. He called aloud for help; there was no time to lose, yet none dared to afford him any. No one, did I say? Yes, little Volney, prompted by filial love, ventured on a deed which strong men dared not attempt. Armed with a broad, sharp saber, he threw himself into the sea, then diving like a fish under the shark, he stabbed the weapon into his body up to the hilt. Thus wounded the shark quitted his prey, and turned on the boy, who again and again attacked him with the saber, but the struggle was too unequal; ropes were quickly thrown from the deck to the father and son; each succeeded in grasping one, and loud rose the cry of joy, "They are saved!" Not so! The shark, enraged at seeing that he was about to be altogether disappointed of his prey, made one desperate spring, and tore asunder the body of the noble-hearted little boy, while his father and the fainting child in his arms were saved. From "Stories of the Ocean"
I'm sure you would agree that Volney became quite a hero as he struggled to save the life of the little girl yet lost his own to the shark! for being a wonderful father to me! Dad, we created a gift of inspiration for you to receive on this special day. Just click here to see! 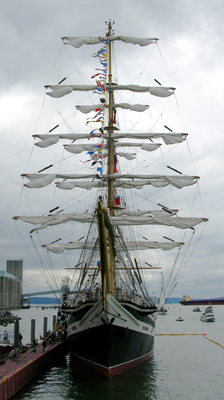 The Tall Ships of Tacoma in July 2005 provided a great event for people of all ages to enjoy. If you didn't get the opportunity to attend the festival, it will return to Tacoma, WA in the summer of 2008. If you are unable to attend the event in 2008, or if you can't wait that long you have other opportunities to attend the Tall Ships in various locations. Would you like to plan a sailing vacation? You may want to consider planning an entire sailing vacation around the dates for a Tall Ships event in a location of your choice! If you have youngsters, they would probably love to dress up as pirates. Their imaginations will run wild as they tour the ships! Our day at Tall Ships of Tacoma was an eventful one and will always be remembered. To view additional photos from our adventure at Tall Ships you may wish to read about our adventure as we took the Tour the Tall Ships. As you look at the photos below you will notice a man in a blue coat as the center of attention. 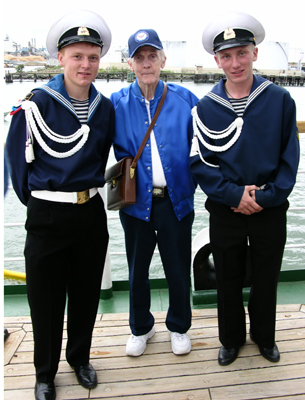 That fellow is my father, George Fosberg and a sailor from WW II. He was the star of the show for me that day! Knowing his love for the sea we were certain he would enjoy the Tall Ships, and I'm ever so grateful for the time he served on the seas to fight for our freedom during the war. 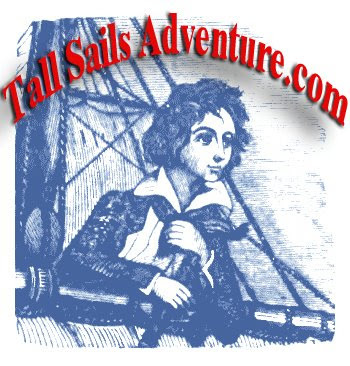 We hope you enjoy this opportunity to explore some of the fun things we did that day, and I fully encourage you to attend a Tall Ships event in the future! Be sure to scroll down to see more photos I took while at the Tall Ships Festival. Pictures of the Tall Ships just don't capture the true beauty of the ships. Touring the Tall Ships is what you really have to do to truly appreciate how awesome they are! Whatever the cost to attend a nearby Tall Ships Festival, I highly encourage anyone to make the effort to go. Other than having to work your way through the crowds, you would not be disappointed! 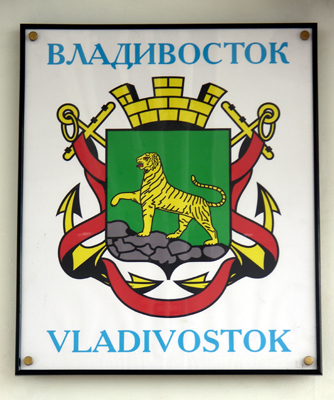 Each tall ship has a personality of it's own, and it's also interesting to meet the ships crew, but to strike up a conversation, unless you're bilingual you may want to take an electronic translation device - lol. Even if the weather isn't warm and sunny, it's worth every minute to have the opportunity to tour such works of craftsmanship. It's a great adventure for anyone of any age! The Seafair Pirates are Landing! Be there bright and early. Early bird free prizes for your kids! There lies the great ocean of song. Like moonlight and sunlight combined. Of long-vanished eras and spheres. Made glad with the spirit of song. Each side of the song-ocean rise. Of God's light with beauty replete. And lave in the ocean of song. The secret of sound and a voice. And bathe in those billows of light. Gush up the sweet billows of song. No drought-time of waters can dry them. And are gladder than gods are, with glee. 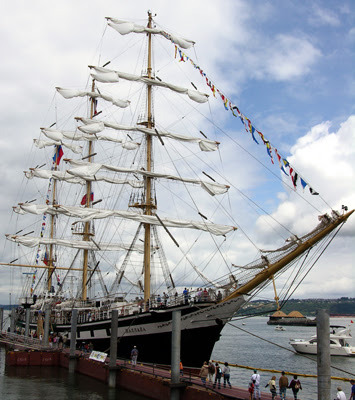 The weather was over-cast and cool the morning we headed for the Tall Ships of Tacoma Maritime Festival. Cool weather is typical in western Washington state for an early July day, so it was of no surprise, but it was still quite disappointing to have the clouds rather than blue sky. We ordered our tickets online to save time. We anticipated very limited parking near the event, so we planned to take a bus. The event planners had numerous buses scheduled throughout town to ease the anticipated parking challenge. My husband, father and I were among 20 or so others waiting for the bus that was scheduled to pick up festival visitors. With much anticipation we all patiently waited, but to no avail. The bus never came. We later learned that the pick-up location was a block away, and we all missed the bus! Not wanting to wait an hour for the next scheduled bus, the three of us decided to take our own vehicle and deal with the challenge to find parking. Although we were able to find a parking space it was nearly a mile away from the entrance to the festival. The three of us agreed that would be our best bet for the nearest available space. At first I had my concerns for my elderly 82 year old father to walk that far of a distance, but he assured us he was up to it as he was always very active. Young at heart and physically fit for his age, he joined us in the walk toward the event without missing a step. My heart was saddened that my mother's health was not well enough to have joined us that day, as I know she too would have been truly amazed at the ships. At the same time I was elated that my father was at least able to attend the event, as he was a sailor in the US Navy during WW II. 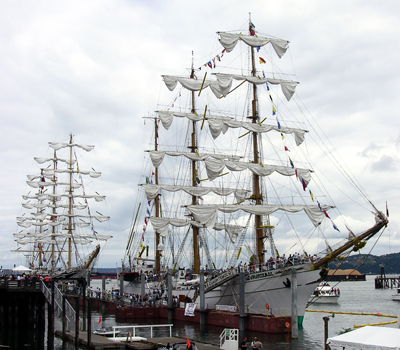 The 2005 Tall Ships of Tacoma maritime festival, took place at the west side of the Foss waterway of Puget Sound near the marina. With excitement we approached the entry gates for the event, and we stood in awe as we gazed at the wonderful tall ships before us. No words can really describe the extent of the beautiful details of all the ships. Wonderfully hand-crafted, each tall ship is truly a masterpiece, and suddenly you imagine you're living in a different era. Although the wait in line to tour the ships was very long, it was well worth it. Each step toward the ships seemed to take forever as we were lost in the crowd of people. 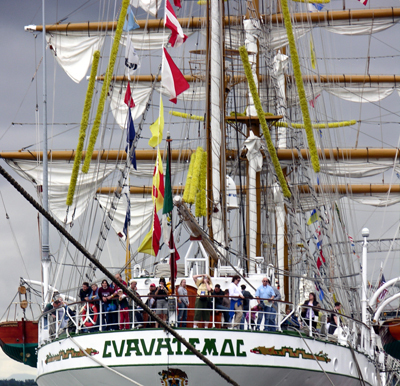 We patiently stood as we neared our turn to tour the Russian ship called the "Pallada", and the"Cuauhtemoc" from the Navy of Mexico." Finally our turn came to board the ships, and suddenly my heart felt like a kid again. As we walked up the ramps to the first docked ship the soft sound of the tied-down sails, and the patter of gentle waves against the ships surrounded us. Suddenly the size and sound of the large crowds no longer mattered as I became engulfed by the beauty of the ships. Stepping aboard I imagined we would be whisked away by one of these wonderful ships into a sailing vacation. My heart longed to take a ride at sea as my senses were taken by the ships glory. With the sails down I could only imagine the beauty of the ships as their full sails would capture the winds at sea to yield to their commands. 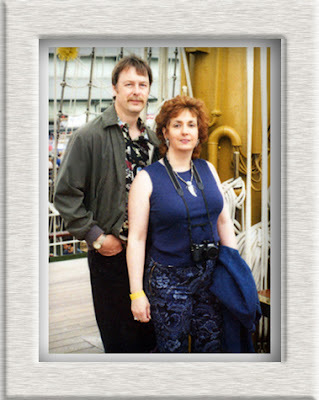 My daydream was replaced with reality as we exited the ships, but it became clear it was well worth the wait to experience the tour as we stepped aboard those magnificent sailing vessels. For many the sea is a compelling force and it seems to call some souls to take a tall sailing adventure at high seas. Below is a poetic example of one young man who was drawn to those tall sails. As a mother, holding her dead child, swayeth herself with woe. And his soul grew sick with listening to that deep undertone. The whispered echo of the sad, sweet warbling of the sea. Away upon the measureless, unfathomed, restless sea. With the drifting tide he loved to hear, but shall hear never more. A low and restless moaning, that we struggle not to hear. Dark, barren, restless, as the sea which doth for ever roll. The flickering shadow of the moon upon the "moon-led flood." Which stretcheth round us dim and vast, as wraps the earth the sea. The soul is almost startled by the power of its solemn tone. How far into this busy world the waves of beauty flow. As the bright, glancing waters of the ever-playing sea. With naked, wave-washed feet almost upon the strand. And whisper in an unknown tongue, she hears not what they say. Ahoy sailors! You have found a place to explore tall sailing ships under the sails of the sun. 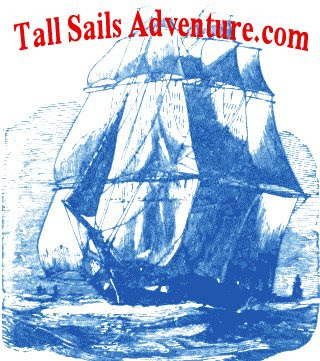 We know you will enjoy your stay as you discover fun things surrounding pirate tales, Tall Ships, and just good plain fun. Imagine that you're taking a sailing vacation off to another land and you just arrived at your destination. We hope you enjoy this adventure you found within the big sea of the Internet. Enjoy your trip at sea! When we learned that the Tall Ships Maritime Festival was sailing into Tacoma, WA near our home town in 2005, it seemed only natural to grab a sailor to enjoy the spectacular day at the waters edge. The first sailor to come to mind was of course none other than my father, George Fosberg. 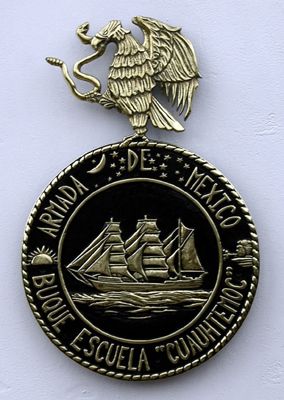 Shown below is my father along with three crewmen from the Navy of Mexico aboard the "Cuauhtemoc". The photo below was one of my favorites from our Tall Ships adventure as we toured the Cuauhtemoc. 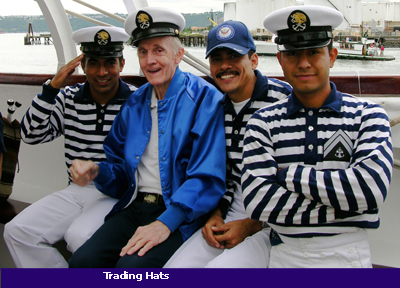 I asked the three crew members if they would pose with my father, and without hesitation the one to the right of my father quickly grabbed my fathers hat, and placed his Navy of Mexico hat upon my father! My father was taken by surprise, but then quickly burst into laughter. As we laughed I quickly shot the photo to capture their smiles. Although the photo doesn't show the details of the emblem on my fathers hat very well, it is a US Navy Veteran cap. My father wears his cap proudly everywhere he goes. He guards his hat well, so you can imagine how surprised he was that someone was able to get it away from him! And, my father of course would not have left without his Navy Veteran cap! That's why the caption on the photo reads; "Trading Hats." 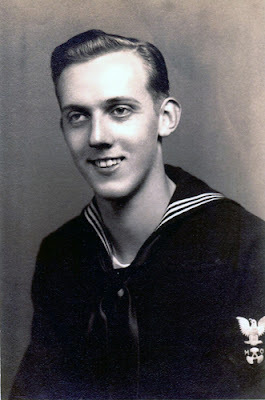 Born in 1923, my father took the steps of a hero as he entered the US Navy on August 9th, 1943. A bright young man and unafraid, he proudly fought for our freedom during WW II. He served his time at sea as a Motor Machinist Mate, and along with his fellow crewmen they assured the Captain that the ships diesel engines would not fail. Aboard the USS LCI (L) 569 Landing Craft Infantry, he not only fought a battle for our freedom, but also a war against waves that were determined to destroy their ship during ferocious storms. They courageously came face to face with war, and the storms in the Asiatic-Pacific theatre. Miraculously, the crew and the ship survived, and he returned home honored with three medals: The American Campaign Medal, the Asiatic Pacific Area Campaign Medal, and the World War II Victory Medal. In honor of my father, and to encourage him to share his Navy war-time experience, it is my hope this blog will serve as an inspiration for him to do so. Okay Dad, you already wrote a ships log on your computer; all you need to do is add a letter B to turn your ships log into a blog! HERE'S to YOU DAD! May this be an inspiration for you to share your memories while serving our country in war-time. We're very proud of you! We love you and Mom with all our hearts, and we thank you for fighting for our freedom!